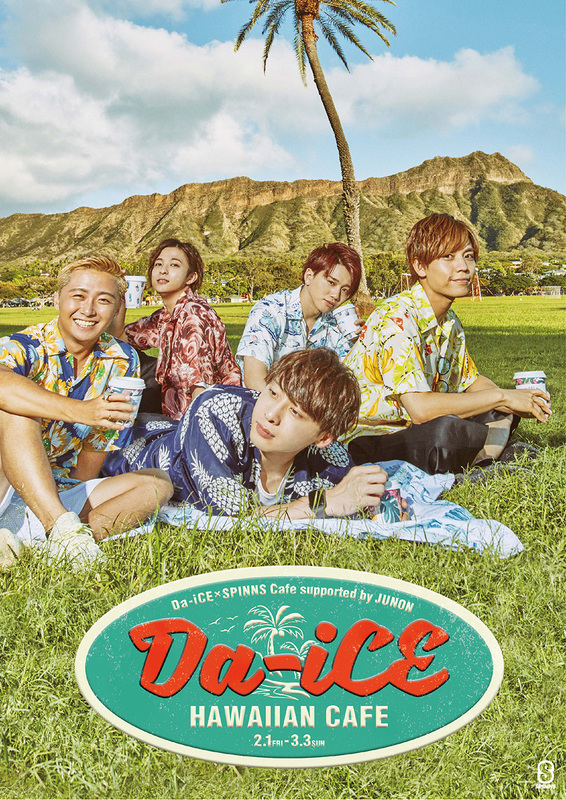 A special Hawaiian inspired menu will be available for fans to enjoy for a limited time as well as the exhibition of treasures from "Da-iCE 5th anniversary Book" which the book itself will go on sale in SPINNS stores nation wide starting 2/22/19 for ¥5,000+tax. Outside of the collaboration café held in Harajuku: SPINNS stores nationwide will sell Da-iCE collaboration merchandise starting 2/1/19. Reservations to visit the café are not needed if the shop isn’t full but you may have difficulties being seated if a lot of customers are visiting at the time you are. If you’d like to make a reservation for your seat- Reservations are accepted through the Sweets Paradise app. The app is available in multiple regions but is in Japanese and requires an account. Or you can visit the store directly and making a reservation in person ahead of time. During this collaboration a purchase lottery will be available. 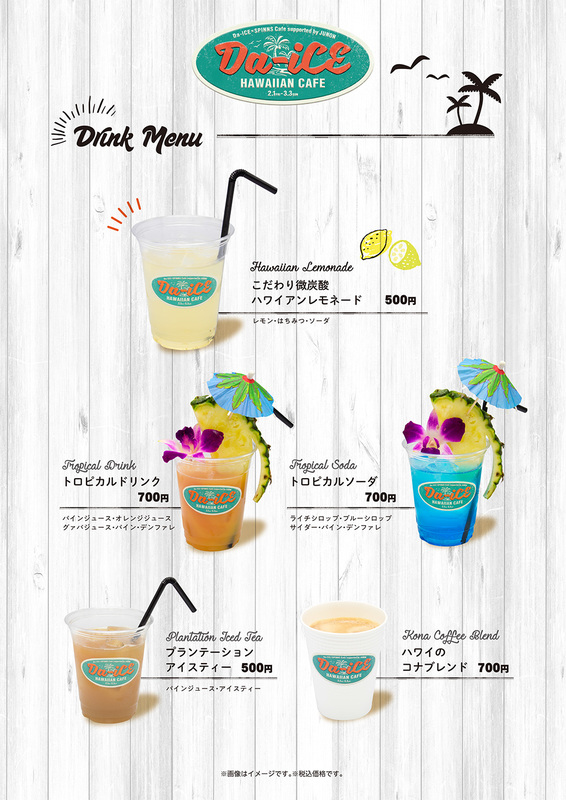 Customers who spend ¥3,000 or more on Da-iCE × SPINNS collaboration items (SPINNS Harajuku Takeshita store only) AND spend ¥2,000 on collaboration menu items at SPINNS café will be eligible to enter a drawing and have the potential to receive one of the 3 prizes below! Additionally if you spend ¥6,000 on eligible collaboration goods and ¥2,000 on eligible collaboration menu items you may enter into the drawing twice! Collaboration visual solo A2 size poster 1 out of 5 designs will be handed out at random. 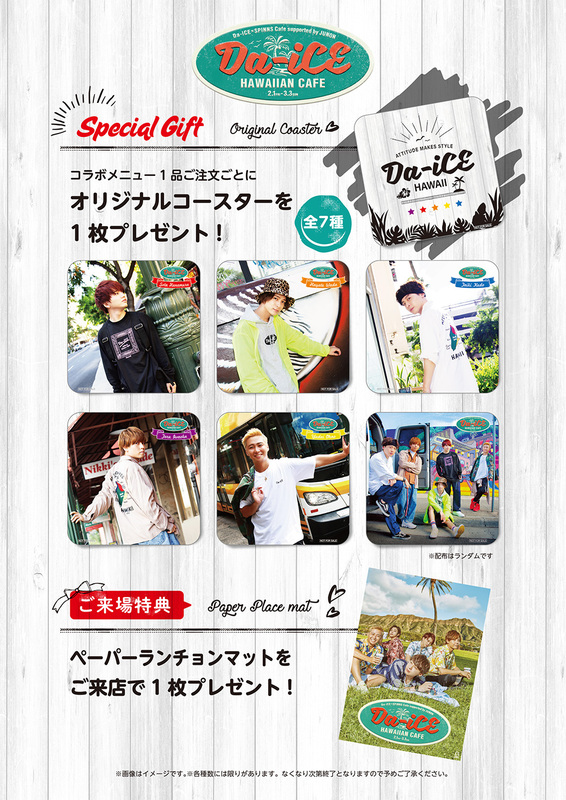 ※ Da-iCE × SPINNS collaboration item purchase receipt to be presented will only be eligible for SPINNS CAFE · SPINNS Harajuku Takeshitadori store. Please understand that purchase receipt in other stores will be invalid. ※ Special lottery lottery is carried out only with SPINNS CAFE. Even if you purchase collaboration items at SPINNS Harajuku Takeshitadori store, please bring your purchase receipt to SPINNS CAFE. ※ Event participation tickets and prizes are limited in number. Once all prizes have been handed out the lottery will end. ※ Participation of lottery lottery will be valid only for the receipt of the day, both receipt of the collaboration item and receipt of the cafe menu. During the collaboration café event on 2/28/19 a special appearance by Da-iCE will occur! They will do a talk show and Hi-Touch. 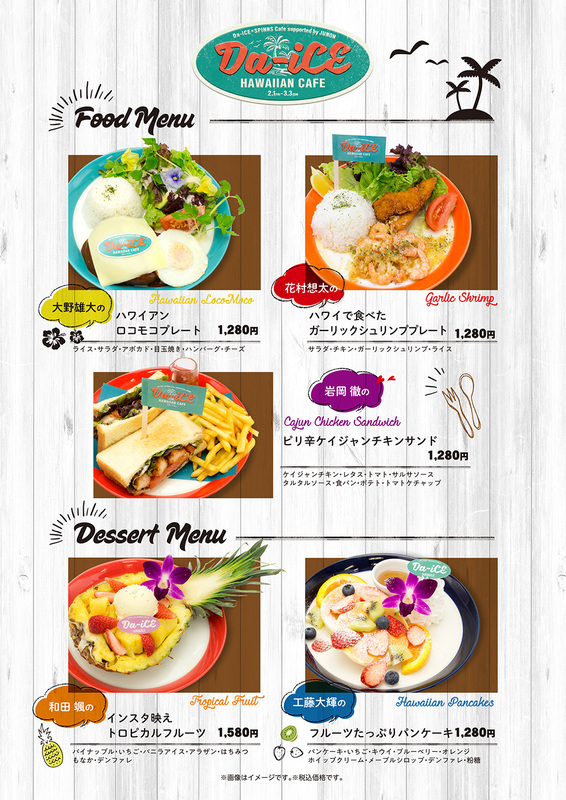 Customers who visit Da-iCE Hawaiian Café will receive an original placemat for visiting the café while supplies last. Customers who order off of the collaboration food/drink menu will receive an original coaster (1 out of 7 designs) at random per order while supplies last.